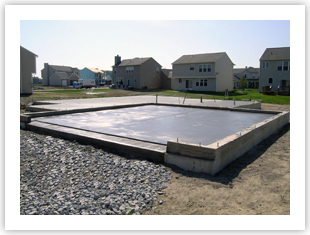 From basements and crawl spaces, to slab-on-grade foundations get a quality turnkey package from Custom Concrete. stabilizing walls with counterforts and reducing shrinkage cracks. A partial basement, (half basement, half crawl space) is a less expensive option that provides many of the benefits of a full basement. Expanded living space for bedrooms, game rooms and home theaters along with storm protection, storage and utility placement. From excavation to backfill, Custom Concrete can provide single point of contact for every aspect of creating a crawlspace to reduce the complexity of scheduling multiple contractors. Stem wall only or complete, turnkey solutions are available from excavation through backfill. Our 16-inch, poured stem wall provides a stronger, more durable product. 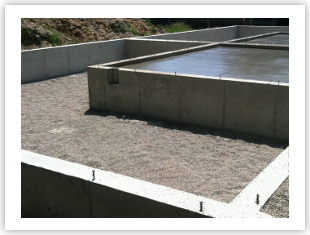 Custom Concrete’s accelerated stem wall process is a cost-effective solution for the first-time home buyer. Other special features of Custom Concrete’s slab-on-grade work: Solid, cast-in-place concrete perimeter walls and limited vertical breaks to meet accessibility needs. Whether it’s time to build that extra bedroom, expand the living area or add another bay to the garage, that all starts with a good quality foundation…and we have the team to get it done! A dedicated layout department and experienced technicians deliver the best foundation in the business. Our attention to detail makes all the difference when properly joining new foundations with existing structures.